I have updated and attached a short presentation I made several years ago about how a world-class competitive intelligence program develops. Click here to download it. The other evening, I attended a chapter meeting of SCIP. 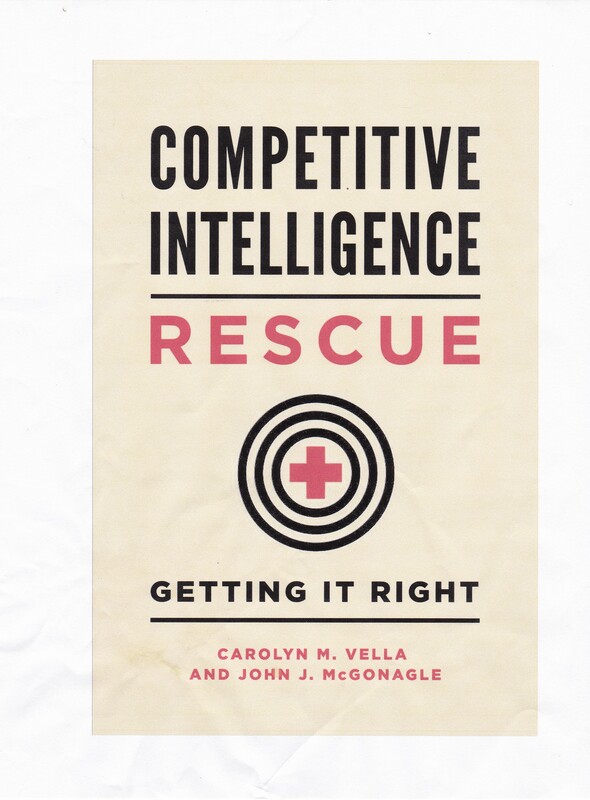 To tell the truth, I was there to plug our new book, Competitive intelligence Rescue: Getting It Right. We had a very fluid discussion among those attending, all very experienced in competitive intelligence. One of the topics that emerged was Millennials. For the sake of privacy, I will not attribute specific comments to anyone. Besides, some of this contains my interpretation of the impact and meaning of these personal observations. Millennials seem to believe that they can easily evaluate the veritable sea of data because they swim in it every day. That often means that they are not interested in a formal analysis of what that data means, i.e., intelligence, but rely on their interpretations, made on the fly. That, in turn, means that they are relatively self-centered in their assessments. Millennials are cautious about or even suspicious of what they see and hear, being raised in a world surrounded by data that is very often unverified and sometimes inherently questionable. That data ranges from advertising to news sources. Oddly, they are not so cautioous about what they receive from personal sources, which has its own downside. Millennials tend to gravitate to secondary data when making decisions, since they have the Internet at hand (literally), a magical source of secondary data. But they shy away from accessing primary research data, that is data developed from interviews of relative strangers. That is because they are reluctant to talk with others, particularly those who are not already a part of their own social or work environments. Many strongly prefer to use email or texts to telephone or face-to-face communications. That, of course, means the immediate loss of the context provided by listening for inflections, pauses, as well as watching body language. All of this bodes poorly for the creation, use, and impact of CI in their day-to-day business activities. For the full texts of these previews, just go to the publisher’s page for Competitive Intelligence Rescue: Getting It Right. “[C]omprehensively breaks down what companies should aim for as realistic goals and how the market is affected by factors outside the company.” Reading Eagle, December 31, 2017, p D6. To all these reviewers, thanks for your kind words. For my blog readers, why haven’t you purchased it yet? (VBG). To help you, here is a link to Amazon.com you can use. Thanks. We all know, or should know, that the purpose of CI is to develop actionable intelligence. That means solid research, sound conclusions, supporting a specific action or decision. One thing that we also all know is that the research that we do is rarely 100% perfect/confirmed/verified. We deal with estimates, approximations, and probabilities, whether it is “70% likelihood of happening”, “more likely than not”, or just “almost certainly”. But conclusions based on estimates are just that, based on estimates. Make sure that you, and other with whom you share your intelligence, never forget this. Sigmund Freud, Moses and Monotheism, Vintage Books, 1967 , p. 17. Writing style is much overlooked (note the unfortunate, but common, use of the passive voice here) when we talk about business communication. However, what we write survives longer than our oral presentations do. A written document can always be referred to after the fact, while a presentation, unless recorded, relies on (imperfect) memory. So, your style of writing is important. The entertaining – conversational, relaxed, and short, but tends to be lighter on content. It is an opening shot for discussion. The direct – short sentences, clear language with no passive statements. It offers an issue and a conclusion. It reads like people (should) sound. The professional – longer sentences, with more technical terms, presumably included for precision. No one, or almost no one, speaks like this – unless of course they are just reading it aloud, which is whole different issue. Then it becomes merely boring and unintelligible. The overbearing – involves complex sentences, heavy use of acronyms. It is aimed at convincing the audience that the author is a real (and perhaps the only) expert on the topic. It is designed to persuade by being overwhelming, including the excessive use of footnotes and/or quotations. The political/bureaucratic – filled with refences to rules, regulations, “context”, and past actions/decisions. Operates to conceal and deflect, by using the passive voice, rhetorical questions, and deep dives into often irrelevant sidebars. Rarely includes any acceptance of the possibility of (a) personal error, (b) institutional failure, or (c) cogent opposition to its conclusions. Which are you (and which is this)? Science magazine recently reported on Twitter and “fake news”. To summarize, new research seems to show that falsehoods spread faster and deeper on social media than did similar postings which were accurate. Ok, so this corroborates the old saying, “Falsehood flies, and the truth comes limping after it” (Jonathan Swift) So what? For those of us in CI, this should be a warning. While social media can often be a rich source for bits of data that would often not be found elsewhere, that data is not, I repeat not, automatically verified, or worse self-verifying. It should be treated as any other non-verified individual piece of data, – that is, not given credibility just because it is coming (seems to come) from a good source. Let’s take a small social media example: LinkedIn.com, largely a business site. It is an open secret that an individual who has been laid off, fired, or quit a job often leaves his/her LinkedIn profile unchanged, or may even “enhance” it a bit. Why? Because of a prevailing belief that it is easier to get a job, or at least be contacted by a recruiter cruising LinkedIn, if you are (or at least appear to be) still working. Given that, how much credibility should we give to a description of what that person does (did) when we building a competitive profile on that firm? Not much, I suggest. Recommendation: when dealing with all social media, DIStrust it (or at least remain neutral) until it is verified – hopefully through using other than social media sources. Maybe that is a little strong, but keep it in mind when you find that social media discloses something “new”, “unexpected”, or ” surprising” about a competitor. In this blog, I have previously discussed the financial and personnel issues, guidelines , training, internal marketing, networking, as well as internal customers and their needs. What products are you providing now? Who uses which products? Why don’t others use them? Are you providing a newsletter? Is it really providing value to the readers or is it just a convenience for those readers? Your product mix should change as your targets – and customers – change. And you should be changing your targets. They are not going to stay static just for your convenience. Feedback from your customers is critical. Get it on a project by project basis, if possible, and, in any case, quarterly. And get it from ALL customers. If they are too busy to talk about your work, how much time do they have to absorb and use it? Feedback should include reviewing what products to add as well as which ones to stop providing. Also check out this past blog. among others: Answers and Questions.